You are an ancient and powerful wizard living in a community for aged but powerful wizards. The guy across the way bubbles his cauldron much too loud, even though you have asked him to turn it down several times. There was a time when those who disturbed your afternoon tea would feel the force of your eldritch wrath. Perhaps this afternoon will be such a time. This game for uses a copy of the Decktet and one Rainbow Pyramid stash per player. (A Rainbow stash is a small, medium, and large pyramid in each of five colours: Red, Yellow, Green, Blue, and Black. For example, a Treehouse set per player or an Ice Dice set for every two players.) Cards represent spells you have in mind; in the game, this means attacks you can make. Pyramids are your circle of magical instruments; they are what you need to have in place to play cards. Your opponent will whittle away at your pyramids, and you at theirs. The first player to run out of pyramids loses. A stack of one or more upright pyramids is called a tower. Place the green pyramids flat in the middle of the table. This area is called the scrapyard. As the game progresses, pyramids in towers can be replaced with smaller pyramids of a different colour. When that happens, it is always the top pyramid in the stack which determines the colour of the tower. For example, a tower which is a one-pip blue pyramid sitting on a three-pip red pyramid is a 'blue tower'. Shuffle the Decktet and deal five cards to each player. The rest of the deck forms the draw pile. To determine the starting player, use the rule for determining start player in the game that one of you has played most recently. Turns then alternate. On your turn, you may do one of three things: attack, draw cards, or remodel. Attacking: You attack by selecting an opponent's tower and playing a card. Which cards you can play for attacks depends on what colour towers you have; at the beginning of the game, you have a complement of towers allowing you to play any attack. The rank of the attack card you play determines the strength of the attack. The suits of the card determine the possible targets. For details, see Attacking below. Drawing cards: Draw until you have five cards in your hand. The only time you may draw cards is when you spend your turn to do so. You are getting old, and you don't have as much stamina as you used to. When the draw pile is exhausted, each player must select one of their own remaining towers and deal one pip of damage to it; see Doing damage, below. Then the discard pile is turned over and shuffled to form a new draw pile. Remodelling: Discard any three cards from your hand. You may exchange the pyramid on top of one of your towers for a pyramid of the same size from the scrapyard. This takes your entire turn. Playing an Ace, 2, 3, 4, or 5 makes a 1-pip attack; you must have a red tower in order to play one of those cards as an attack. Playing an 6, 7, 8, or 9 makes a 2-pip attack; you must have a blue tower in order to play one of those cards as an attack. Playing a Crown ( ) makes a 3-pip attack; you must have a yellow tower in order to play one of those cards as an attack. Green towers can be used as wildcards to make any kind of attack, but the tower takes 1 pip of damage for being used it in this way. The suits of the card determine which of your opponents towers you may attack. A can be used to attack a black tower; a or can be used to attack a red tower; a can be used to attack a blue tower; a can be used to attack a green tower; a can be used to attack a yellow tower. 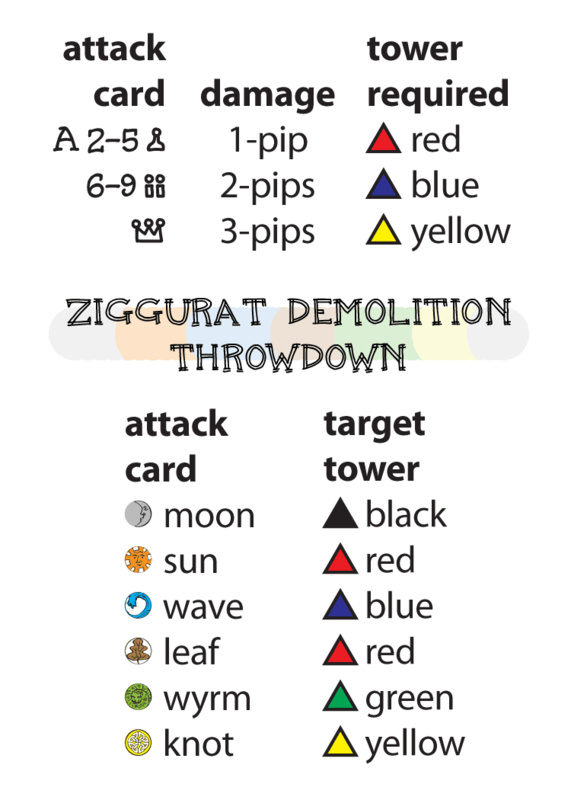 This follows the closest color match between suits and pyramids, and it's summarized in the table below. This can take a few plays to get straight, remember: The rank of the attack card determines the strength of the attack and is constrained by the colour of the attacker's towers. The suit of the card determines what can be targetted and is constrained by the colour of the defender's towers. If your opponent has more than one tower which is an eligible target, pick one and announce that it's one your attacking. If your opponent has no towers that are eligible targets, then you can't make the attack. When a player makes an attack, their opponent may play cards to defend. In order to play a defense, the target character must have a black or green tower. The defender plays an Ace with a suit that matches the color of the target tower. The defender plays one or more cards with total ranks exactly equal to the rank of the attack card. Aces are 1; s are 10. Example: Evan attacks with a 7. Maris could defend by playing a 7, a 3 and a 4, or any combination of cards with ranks adding up to exactly 7. Either kind of defense nullifies the attack. Both the attack card and defense cards are discarded. When a tower is damaged, remove one pip of pyramid for each pip of damage done. The damage is always taken starting at the top of the tower, and the pyramids removed are placed flat in the scrapyard. If it is not possible to remove pyramids of exactly the right size, then ‘make change’ from the scrapyard. The player inflicting the damage selects a smaller pyramid from the scrapyard to be placed on top of the tower. This may change the colour of the tower. Example: Evan's blue tower is undamaged; it consists of a 1-pip pyramid on a 2-pip pyramid on a 3-pip pyramid. Maris makes a successful 2-pip attack against the tower. Even moves the 1-pip and 2-pip pyramids to the scrap pile, Maris picks a 1-pip green pyramid from the scrap pile, and the green pyramid is placed on the top of the tower. It is now a green tower. If a tower takes more damage than it includes pips worth of pyramids, the pyramids are placed in the scrapyard but the extra damage has no effect. A green tower allows to play an attack card or defense cards that would otherwise require a colour of tower which you do not have. When it is used in this way, the green tower is dealt 1-pip of damage. Since you are the one dealing damage to your own tower when you use a green tower in this way: If the green pyramid at the top of the tower is a 2-pip or 3-pip pyramid, then you may replace it with any pyramid from the scrapyard of the next size down. When a player has no towers remaining, they are out of the game. The battle ends when only one player has towers remaining. The survivor scores one point for each pip of pyramid left in their towers. All players earn points for having destroyed opposing towers. When a particular player loses a tower for the first time, the attacking player gets 1 point; the second time, 2 points; third, 3; fourth, which eliminates them from the game, 4. If the player destroys their own tower, then no points are awarded for that tower. Lots of the strategy in this game centers on controlling the colours of your own and your opponent's towers. For your own towers: Once one of your towers has been destroyed and you only have three left, you can't have towers that do everything. For your opponent's towers: If you restrict the number of colours they have, you restrict their options; if you restrict it too much, it becomes hard to find attack cards that can target their towers. Suns ( ) and Leaves ( ) may be used to attack red towers. This means that there are more cards in the deck that can attack red towers than there are for any other colour. You can destroy your own tower if it consists of a 1-pip green pyramid (and you use it for something) or if the draw pile is exhausted (and you take attrition to a 1-pip tower). In the two-player game, this is almost never a good idea. In the multi-player game, it's a way of denying your opponents points. The extended deck: If you want to add the Excuse, Pawns, Courts, just shuffle them into the deck. The Excuse may be played as a defense against any attack, although you must still have a black tower; it plays like an Ace of any suit. If played at the same time an attack is made, before your target decides whether or not to defend, it makes the attack unblockable; that is, no defense can be made against such an attack. A Pawn may be played for a one-pip attack. A Court may be played for a two-pip attack. Here's a table with the extended deck inserted. Reference cards, formatted for printing on letter paper; For the same card as single image, click below.